The latest installment of NBA favoured basketball simulation franchise has launched for months and lots of gamers are constantly on a hunt for tips to improve the game. Recently, the most of the noteworthy NBA 2K17 European E-sports Tournament revealed. Yesterday, 2K announce NBA 2K17's first ever European All-Star Tournament that will take place online on 10th and 11th December from 16.00 GMT/ 17.00CST to 00.00GMT/ 1.00CST. Finalists will get the chance to compete at the renowned NBA headquarters in London with the added bonus of attending the NBA Global Games London featuring the Indiana Pacers and Denver Nuggets at the O2 Arena. The Champions will win an all-expense paid trip to the NBA All-Star Weekend in New Orleans, Louisiana. "We believe NBA 2K17 offers a unique competitive experience for eSports enthusiasts worldwide", said Alfie Brody, VP of Marketing for NBA2K. "Following our first eSports tournament, Road To The Finals, culminating this past June in Los Angeles, it was a high priority for our brand to expand the competition to Europe. 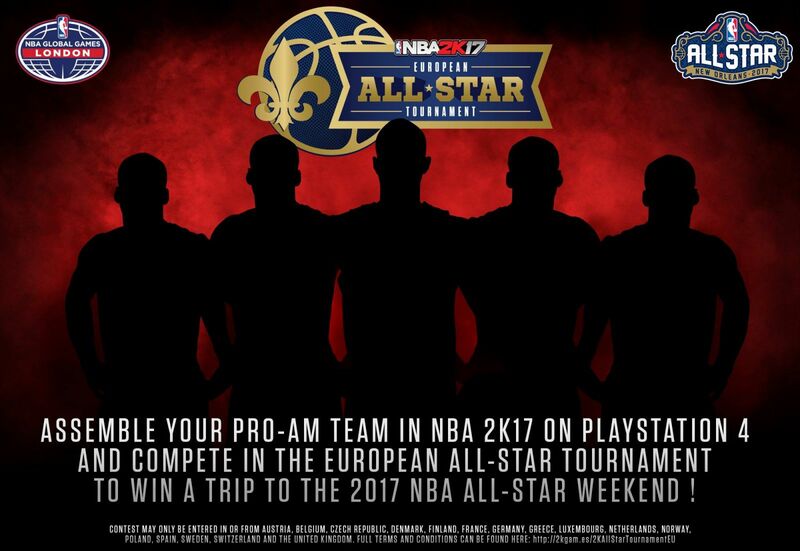 We're excited to offer our European customers the same thrill of global competitive gaming and the chance of being crowned the top NBA 2K team in Europe"
For a chance to win, participants need to assemble a Pro team of at least 3 players (with a roster allowing up to 10 players) in Pro-AM mode of NBA 2K17 on PlayStation 4 computer entertainment system and compete against others within the two-day event. The team with the highest score at the end of each contest day will compete in the finals in London on 10th January 2017, battling it out for the ultimate trip to the All Star Game in February 2017. More news that may be released for "NBA 2K17" should be made available in the near future. Follow U4NBA on social media and look for the news page for the latest NBA 2K17 news.